Wypall X60 Wipers feature the superior absorbing power of HydroKnit technology, allowing them to absorb more than twice as much water as ordinary rags. These lightweight wipers are designed to outperform laundered rags, raising the standard for general purpose wipers at a value price. These wipers are ideal for applying thinners and solvents, adhesive cleaning, removing lubricants and removing grease in soil in tight areas. Wypall X60 Wipers are reinforced for extra strength, wet or dry and are made without adhesives or binders, so they won’t leave behind residue. Sturdy enough for repeated use, these cleaning wipes are designed to reduce waste so you spend less. 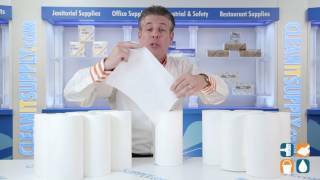 Wypall X60 wipes come in perforated sheets measuring 9.8” x 13.4” and come on a small roll for easy storage and dispensing. If you are looking for effective cleaning wipes at an economical price, you’ve found them. Stock up on Wypall X60 Wipers today and save!